I learned at a young age that time is relative, particularly historical time. Something ancient history to me might be a fond memory to my parents or grand parents. (Or not so fond, as in the Great Depression or various wars.) My mother liked to laugh about the occasion when she woke up her history-obsessed daughter so she could view a site we passed during a long trip. She knew I hated to miss a historical marker. I supposedly commented, “That isn’t very old. Groton is older,” and promptly went back to sleep. We lived in Groton Massachusetts for less than a year, but it had apparently reset my historical clock from Midwest time to New England time. On my first visit to London, I had a similar experience. I took the underground to the Tower of London, the first place on my wish list, with my head buried in the twelfth century and my imagination fueled by medieval London. When I climbed up out of the station a statue greeted me. It wasn’t William the Conqueror or a medieval night. The Emperor Trajan stood there in front of a portion of London’s Roman wall. The Romans! My historical imaginings were thrust back another thousand years. I had to sit down. Americans don’t do history in thousands of years. It took some getting used to. As I’ve grown older such things surprise me less. I’ve learned to always seek the oldest house or church or ruin wherever I go. It puts a place in perspective; I may as well get it over with. Then I went to Orkney. History jumbles up with history in Orkney in no particular order, and much of it makes the Romans look like newcomers. If your ferry docks at Saint Margaret’s hope, you have to take the A961 from South Ronaldsay Island to the Orkney Mainland—which is to say you have to drive over the Churchill Barriers, a series of causeways built by prisoners of war during World War II to protect Scapa Flow. You may not have stepped foot in the place yet, but you’re already riding over history. Scapa Flow, visible as you drive, has been a vital port for centuries from the 11th century Vikings to the 20th Century British navy. In 1918 74 ships of the German navy were interned at Scapa Flow pending the treaty negotiations. When the negotiations dragged on with no word, the German Admiral ordered the entire fleet scuttled lest there be a renewal of hostilities and they fall into British hands. Many of them are still down there. Twenty years later a sneak attack by German submarines at the outset of the next war sank HMS Royal Oak. You can understand why the Churchill barriers were built. 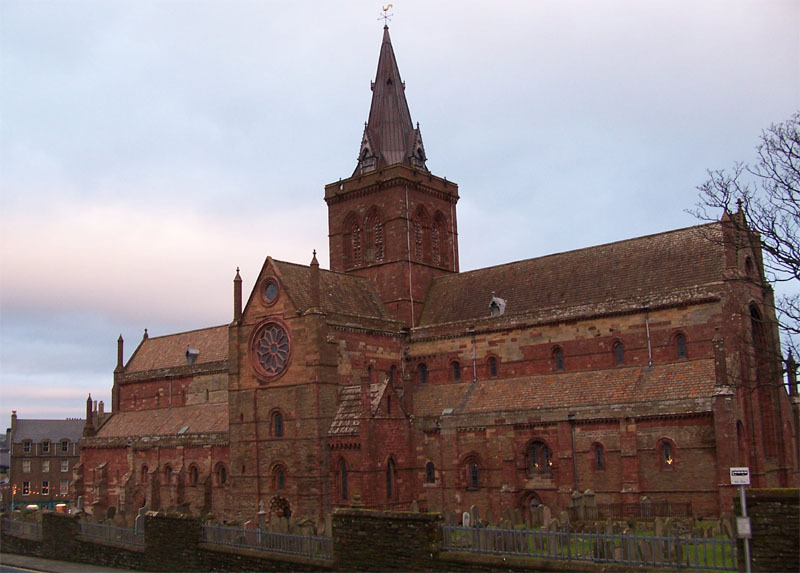 Walking around Kirkwall, primary town in Orkney and my first stop, the sense of moving backward in time began to dawn. Victorian buildings about, but you learn that the Viking Sagas mentioned the town as early as 1046. Its cathedral dates to the twelfth century. The Bishop’s Palace was built in the mid-1100s and Earl’s Palace completed in 1607. There were “earls” of Orkney from Norway by the beginning of the tenth century, and Norway continued to rule Ornkey with varying degrees of control for over 500 years. The date for Scottish rule is usually given as 1468 when Christian I pledged the islands to James III as dowry for his daughter Margaret. Christian, one supposes, was broke. Orkney was Norse for twice as long as the United States has existed, and many place names and family names continue to reflect Norse heritage. These days some of Orkney’s chief attractions are its Neolithic sites, however, and we headed that direction quickly. 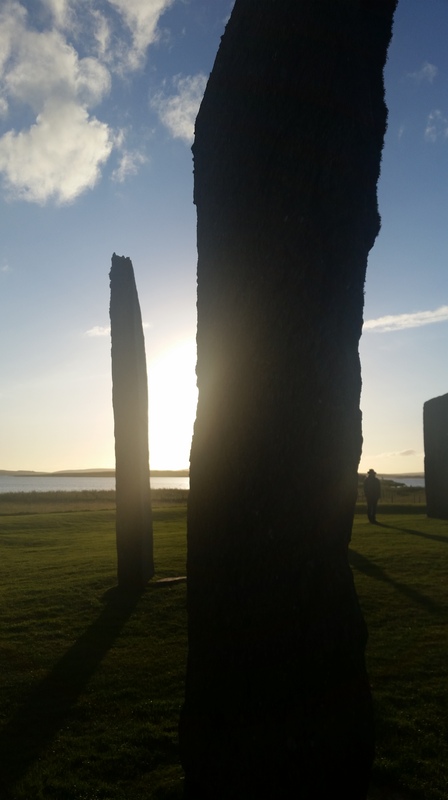 The most dramatic are the standing stones, among them the Ring of Brodgar and the Standing Stones of Stenness. The standing stones date from at least 2500-2000 BC, eons before any Viking long ship considered visiting the islands. Less dramatic initially, but in their way more fascinating, are the unearthed Neolithic settlements such as Skara Brae, a settlement that existed up to approximately 2600 BC and the Barnhouse Settlement, 450 or more years older. 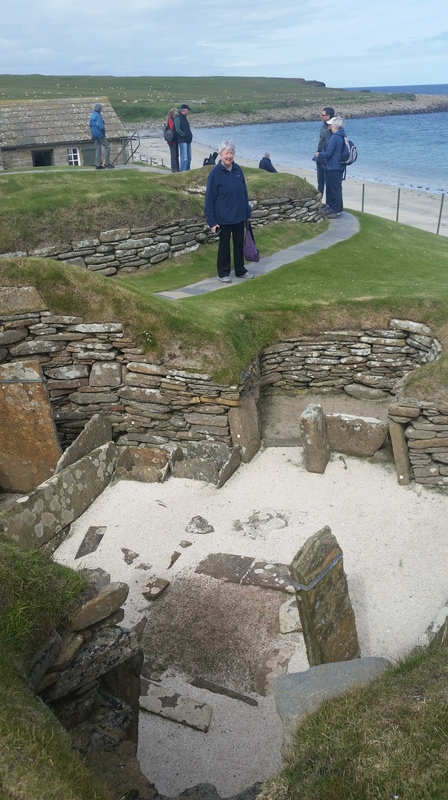 Skara Brae is a protected but open for visitors. Its connected honeycomb of underground dwellings intrigued me, as they have many others. I began to ask, who were these people? How did they get here? What, if anything connects them to the standing stones or to Neolithic sites elsewhere in Britain? I have no answers, but the creative parts of my brain lit up. 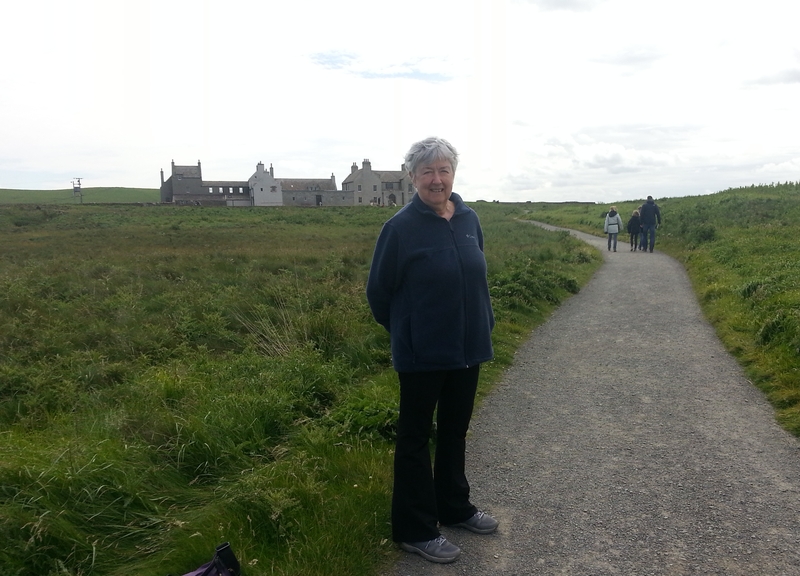 Near Skara Brae, at Skaill House, history explodes in a jumble. You can walk the four thousand years of history between the two sites. Skaill House itself appears in records dating from 1492. 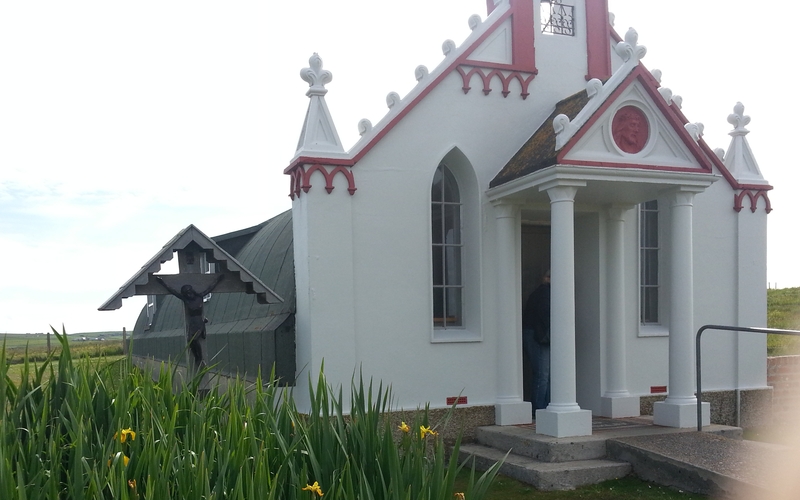 The existing house came into the possession of the Bishop of Kirkwall, George Graham, in 1615. One of his descendants discovered Skara Brae. Another is the current Laird. 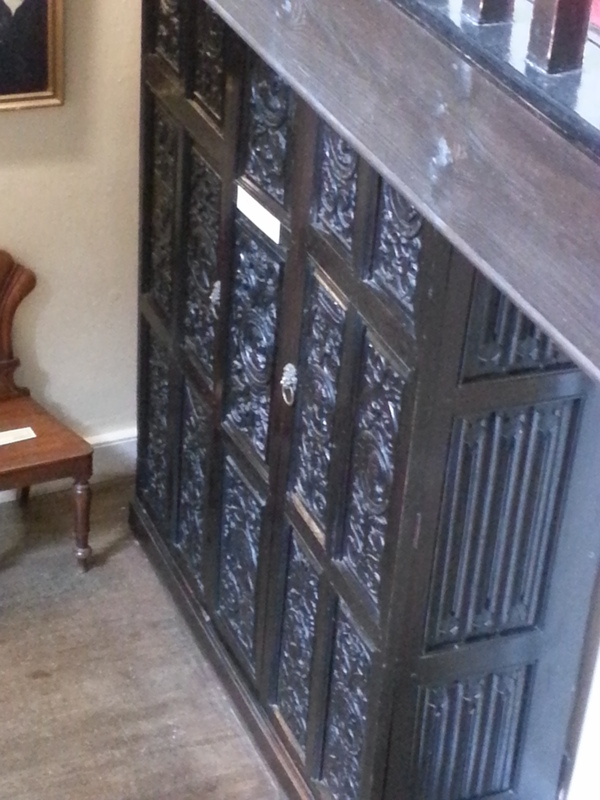 The family’s collections of memorabilia, weapons, Norse silver, seventeenth century furniture (Including the “Armada Chest,” reputed to have been made with wood salvaged from wrecked ships of the Spanish Armada), and so on fill in many historical gaps. History jumbles up with history at Maeshowe as well. A guided visit led us inside one of the largest, most elaborate Neolithic burial mounds on Orkney. The tomb is interesting in and of itself, but another story grabbed me even harder. The tomb, already over two thousand years old, was breached. By Vikings. The Viking Sagas record the incident in which a raiding party was caught in a snowstorm and broke into Maeshowe from the top to wait out the storm. They left behind graffiti. Using twentieth century lighting and twenty-first century smart phones we studied thousand-year-old graffiti in a 5000-year-old tomb. Goodness. 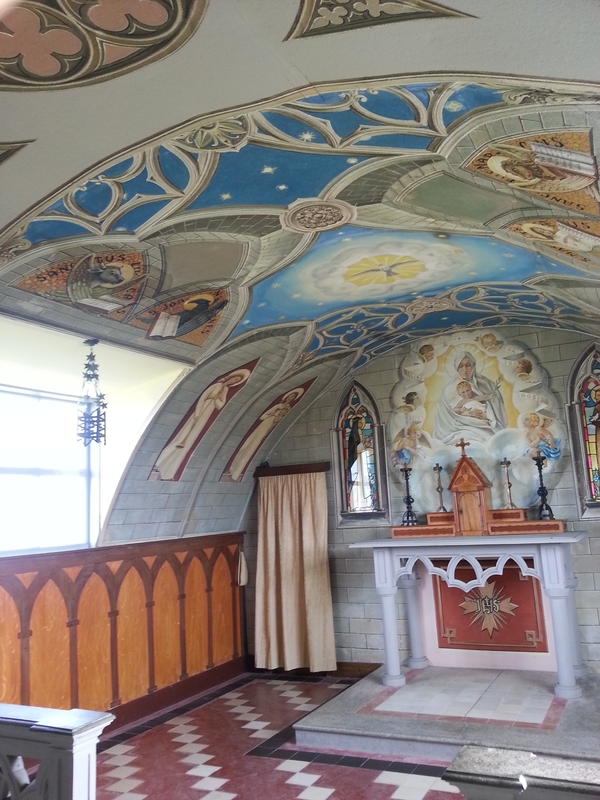 thing of beauty with ironwork and plasterwork designed to fool the eye into thinking you are in a small Italian church. Orkney has preserved their masterpiece with care. Onto the twenty-first century ferry and gone. The trip had taken me deep into time and back, but one thing struck me. There had been no Romans. Caroline Warfield’s passions are family, travel, and writing. It should be no surprise that the first two fuel her stories. She writes historical romance in which she nudges her characters to explore the riskiest territory of all, the human heart. In addition to History Imagined, she is a regular contributor to The Teatime Tattler, a blog in the shape of a fictional nineteenth century scandal sheet. The trip to Scotland resulted in a short story, The Whaler’s Treasure, that she plans to give as a gift to subscribers to her newsletter. Love this post! Yes, that sense of time overwhelms Kiwis when we travel. We live in a country that in human terms is very young. 700 years, and before that just birds, insects, and a few bats. I agree with Jude and you, Caroline. I heard somewhere recently that Paris is more than 2000 years old and it took me more than a few minutes to process that fact. Since most of my travels have been within the US borders, I tend to forget that not every nation is as young as we are. I think my Beloved’s favorite spot in Paris was the Roman city beneath the square in front of Notre Dame Cathedral, which was ancient already when the cathedral was built. From History Imagined, about the long arc of history. I do the same! I was a history major in university and I get so excited when I visit places I’ve learned about! Great article, Caroline! The Orkneys are on my bucket list!